November 25, 26, 27, 28 & 29, 1969. “A twenty-first anniversary represents a significant milestone. The Wick is working hard on the plays to be presented to mark this anniversary year. We have progressed over these years, but cannot deny it is increasingly difficult to operate with the required efficiency. For this reason we have two other milestones we must reach this year. Firstly, an increase of experienced actors, youth to train, and those interested in performing behind the scenes – often more ‘interesting’. Secondly, a permanent home theatre workshop is necessary to develop our productions to even higher standards. This costs money, and although our reserves have increased through jumble sales and lotteries they are still insufficient, as you will have seen in the foyer tonight. A Shoreham family are so interested in amateur dramatics that they are all taking part in the Wick Theatre Company production, Wait Until Dark, later this month at the Barn Theatre, Southwick. Mr. Brian Moulton and his wife Frances are both well known for taking leading parts in previous productions by the Wick. Now their daughter, Barbara, and son Stephen, both in their teens, are also taking part. Amateur dramatic societies all over the country are faced with similar problems of presenting the right play to attract the largest audience and to ensure setting and staging measures up to professional stage productions. People having a taste for the best in televisions and the stage, will not fall for less than the best in amateur productions. One can be justly proud of Wick Theatre Company, who only present the best in drama or comedy and who’s staging of plays in the Barn theatre, Southwick, is of great merit. The thriller, Wait Until Dark, by Frederick Knott, being presented this week, is excellently staged and well presented, containing all the drama and suspense that they story contains. Superbly produced by Ralph Dawes, the scene is a basement flat in Nottinghill, the home of Susy Henderson, a blind girl. This part is sensitively portrayed by Sue Brown, who holds the audience in a most compelling way. Her husband Sam is played by Barrie Bowen. Brian Moulton, in the part of Croker, gives a powerful performance as a crook, and there is good support from Neil Shepard, as Mike, another crook, and Anthony Deasey as the sly Roat. For a girl so young, Barbara Moulton gives a surprisingly good performance as Gloria, the girl who helps Susy, but who can get into tantrums. Jack Bingham and Ralph Dawes ably fill the parts of policemen. The story of who cons who is so exciting that it has quite a spell-binding effect on the audience. This play has been entered in the 1969 West Sussex drama festival and will be adjudicated after the Wednesday performance by John White, a member of the Guild of Drama Adjudicators. The two winning productions of the festival will be performed at the Esplanade Theatre, Bognor, on the afternoon and evening of December 13. Other Wick Theatre credits: set design, Teddy Morrison; stage manager, Frances Moulton; stage lighting, Frank Hurrell and Ken Parsons; effects, Terry Mase and Terry Gibbs; properties, Frances Thorne and Margaret Perrett; decor, Elizabeth Penney; wardrobe, Morfydd Bowen and Carol Brand; display photographs, Ian Leavey; front of house manager, George Porter. There is little that one can write about the plot of a thriller without giving the game away, so let me just say that Wait Until Dark by the Wick Theatre Company is gripping, not without surprise and is thoroughly good entertainment. The baddies are Mike, Croker and Roat. Mike, the most likeable of the trio, is played smoothly and well by Neil Shephard. Croker is portrayed by Brian Moulton with considerable technical skill which lifts the play out of one or two dull moments. The unpleasant Roat is played incisively and ruthlessly by Anthony Deasey. To Sue Brown falls the difficult rôle of a blind woman, which she brings off with ability and care. The small rôle of her husband, Sam, is played by Barrie Bowen with Jack Bingham and Ralph Dawes making a brief appearance as policeman. Gloria, the little girl upstairs, is played with a delightful naturalness by Barbara Moulton. This is not an easy part for a young girl and Barbara does it very well indeed. Not only is Ralph Dawes to be congratulated on his direction of the play, but the stage management team also. Frances Moulton and Stephen Moulton do an excellent job, and Frank Hurrell and Ken Parsons take care of an intricate lighting plot with precision. There are final performances tonight and tomorrow at the Barn Theatre Southwick at 7.45 p.m. and there is the opportunity of a good evening’s entertainment. Imagine you are a woman, recently blinded in an accident. Your husband goes off for the day just after there’s been a murder near your flat, and during that day the strangest things keep happening. 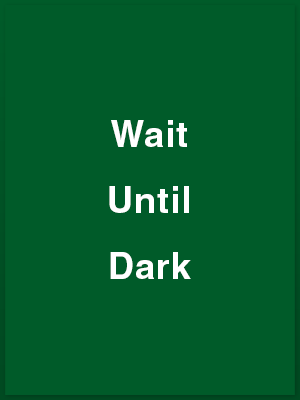 That’s the theme of Frederick Knott’s thriller Wait Until Dark, which is already threatening to become a classic such as Dial M for Murder. Reason for the title is that, when night falls, a blind woman can cope better with her assailants in the dark. This play is not an easy one for amateurs, because of the intricate timing and the complicated stage props and effects. Yet the Wick Theatre Company at Southwick this week, under the direction of Ralph Dawes, are offering a truly professional production. I saw this play during its West End run and I can honestly say that the Southwick performance suffered very little by comparison. Sue Brown has a long and arduous task rôle as the blind woman and manages to convey sightlessness very well, particularly in small mannerisms such as the way she uses a telephone. But the star of the evening is undoubtedly Anthony Deasey a the crook, Roat, whose evil whisperings made my hair stand on end even more than usual. His two henchmen, played by Neil Shephard and Brian Moulton, at first appear too decent for the mean, small time crooks they represent. But as the play progresses and they con the blind woman respectively as an old school friend and a seedy detective, they get better and better. Barbara Moulton plays a 12-year-old with all the haughty naughtiness and loyalty the part demands and Barrie Bowen is effective in his brief rôle as the blind woman’s husband. Mention must be made of Teddy Morrison, Frank Hurrell, Ken Parsons, Terry Mase, Frances and Stephen Moulton, Terry Gibbs, Frances thorns, Margaret Perrett, Elizabeth Penney, Morfydd Bowen and Carol Brand, who, between them, ensure that the play runs smoothly. One small mistake in lighting could have ruined it. The play is improbable, but I willingly suspended my disbelief to enjoy it. It is on at the Barn Theatre until tomorrow night.